Gone are the days when people plundered through the woods with nothing but a battered map and a compass to find their way. While tales of Man vs. Wild still keep us entertained, it's no surprise that with today's technology, it's becoming easier and easier to have a wealth of GPS information right at your fingertips, even outside of wi-fi hot spots and 4G. While I am aware that hiking is an activity designed to forget technology and live "off the grid", it can also be a matter of safety and convenience to have your phone doubling as a resource and lifeline. Here are some apps I have on my phone that will be greatly beneficial during my hike. I plan to review them again afterward, so check back for the full testimony. I am already really impressed with this app! I think it'll be a huge resource while on the trail. Guthook has provided photos of trail waypoints, GPS positioning, distances to the nearest water sources (a big deal in the desert...), elevation profiles, and trail registers so that fellow hikers can comment on current trail conditions. It comes in five downloads: southern California, central California, northern California, Oregon and Washington. To keep up with finances on the trail (yes, when hiker hunger kicks in, I'll probably be spending lots of money on peanut butter and pizzas) this app seems to do the trick. Like the popular Mint app, PageOnce pulls your data from your online bank accounts to give you an updated view on how your money is doing. You can even pay bills through this app. Another finance app I have is Checkbook, which requires manual entries, but it's a good way to see exactly how much money you have in each of your accounts and on your credit cards, and it makes spending/income graphs for you. Dana of Wonder Forest is a web designer/blogger that I have been following for a while, and lo and behold, just recently she piloted her own Blogger app for mobile posting on your phone. It's streamlined, classy, super user-friendly and fun to blog with! I can't wait to try this baby out on the trail. Hopefully it'll make updating posts even simpler. This app doesn't have Halfmile's maps on them, but it is set up for use in tandem with a printed set. This app helps keep you on trail, and if you happen to stray, it helps get you back to the trail. PCTHYOH stands for Pacific Crest Trail Hike Your Own Hike. It's the trail mantra of any long-distance hike: don't hike for any other reason than yourself. 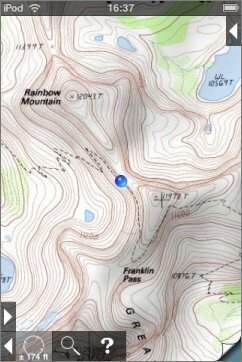 This app is the keeper of many helpful PCT resources: Halfmile's maps (in PDF form), water source reports, compass readings, current weather conditions, fire reports, trail closures/conditions, phone book, snow reports, and PCT journals. A wealth of info all in one spot. This is a great app not only for the PCT, but for hiking trips in general. It downloads USGS topo maps onto your phone and seamlessly links them together so you can plot your exact position on them. It allows for shading of slopes, dropped waypoints, compass readings, lat/long coordinates and a very accurate pin-point of location. You simply choose which maps you want to download before your trip and then you don't need 3G or wi-fi in order to access your location and data. The phone pulls info straight from satellites so you can be off the grid and still find your way back. This is a great alternative to a full-powered GPS unit. One additional note: the PCT is hard to distinguish on the TopoMaps, but fortunately Halfmile has downloadable waypoints you can integrate into the app so you can see the whole trail! Visit here to download the zip files onto your phone or GPS unit. This solar charger is portable enough to carry in your backpack, but powerful enough to charge your phone many times over. You connect the Guide 10 battery pack (which also recharges AA batteries for your camera!) to the solar panel, charge the battery pack in 4 hours under direct sunlight, and then charge your phone with the battery pack in 2 hours. Brilliant. 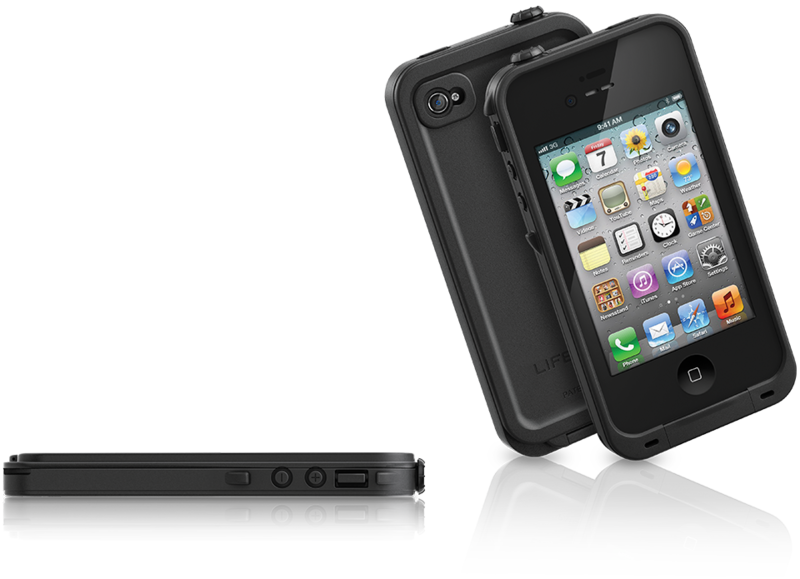 Waterproof, dust proof, shock proof, snowproof... what more could you want? I hope this has been helpful for your next outdoor adventure with your phone!